Bernie Brookes is the Chief Executive Officer and Managing Director of the Myer Group. In this role, Bernie has been responsible for the transition of Myer following the separation from the Coles Group and for rebuilding the Myer business under new ownership. Bernie has spent 34 years working within the retail industry in local and international roles in India and China. Prior to joining Myer, Bernie was a Management Director of Woolworths and was a chief architect of Woolworths Project Refresh, which reduced costs by more than $5 billion over five years and reinvested these savings back into the business. 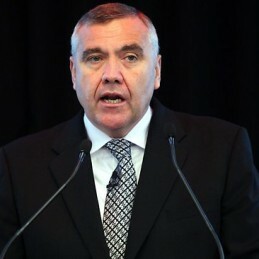 Bernie has also held a number of roles as president and executive of various industry organisations including Retail Traders Association in Queensland and Victoria and President of the Queensland Grocery Association, and he has assisted on a number of charitable and government ventures and committees. He is currently an Advisory member of The Salvation Army Australia Southern Territory Territorial Advisory Board. Bernie has received many awards, including Food Week Retail Executive of the Year, National Retail Association Food Industry Executive of the Year and Food Week Buyer of the Year for four years during the 1980s and 1990s. Bernie is currently patron of the Australian Joe Berry Memorial Award and the Australian representative judge of the World Retail Awards. Ultimately motivated by results, Bernie brings 30 years of experience and substantial skill in managing change, organizing people and leading teams with a passion for entrepreneurship and empowerment. When he speaks, he draws on a rich tapestry of stories and successes from some of Australia’s significant retail giants.